New York: Charles Scribner¹s Sons, 1952. 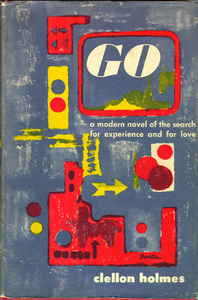 ORIGINALLY CALLED "THE Beat Generation," Go is the first published literary work to use the term "beat." A friend of Allen Ginsberg and Jack Kerouac, Clellon Holmes viewed the Beat scene from the sidelines. Go is a thinly disguised account lifted directly from the lives of Ginsberg, Kerouac, Burroughs, and others who hung around Joan Vollmer's (the future Mrs. William Burroughs) apartment near Columbia University. Holmes attempts to capture the essence of the Beat experience: "It was a world of dingy backstairs "pads," Times Square cafeterias, bebop joints, night-long wanderings, meetings on street corners, hitchhiking, a myriad of "hip" bars all over the city, and the streets themselves. It was inhabited by people "hung-up" with drugs and other habits, searching out a new degree of craziness, and connected by the invisible threads of need, petty crimes long ago, or a strange recognition of affinity. They kept going all the time, living by night, rushing around to "make contact," suddenly disappearing into jail or on the road only to turn up again and search one another out. They had an idea of life that was underground, mysterious, and they seemed unaware of anything outside the realities of deals, a pad to stay in, 'digging the frantic jazz,' and keeping everything going . . . . you know, everyone I know is kind of furtive, kind of beat." San Francisco: City Lights Books, 1958. GREGORY CORSO SPENT his early life in and out of foster homes. At the age of twelve he began living on the streets of New York, sleeping in the subway or in abandoned cars. He was sent to Clinton State Prison at the age of sixteen for robbing a Household Finance Office, and there he began educating himself in the prison library. Released at the age of twenty, Corso moved back to New York where he met Allen Ginsberg at the lesbian bar, The Pony Stable. Ginsberg was impressed with Corso's poetry and excited to meet another authentic street person. Always the promoter of his friends' literary efforts, Ginsberg introduced Corso to the Beat crowd and helped get his poems published by Lawrence Ferlinghetti at City Lights Books. NOTE THE LINE to Allen Ginsberg at the top of the page: "Allen, check this for rhyme scheme," and on the second page, "Dear Al­quite corny but I'll leave it." New York: The Poets Press, 1965. LIKE NEAL CASSADY and Gregory Corso, Herbert Huncke left home at an early age and learned to live on the street, engaging in petty crime and prostitution. He met Burroughs in a Times Square bar and quickly introduced him to New York's seamy drug culture. Huncke became a regular among the early Beat crowd and followed Burroughs to Texas, New Orleans, and Mexico. 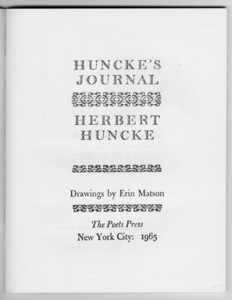 Huncke produced little in the way of literature; he was Beat inspiration in the flesh. Huncke's Journal is his personal account of adventures with his Beat friends. Carl Solomon. The Entrance of The Grand Gladiola. New York: Floating Bear No. 12, 1961. THE THIRD OF the Beat muses, after Neal Cassady and Herbert Huncke, was Carl Solomon. Solomon grew up in the Bronx and was considered a child prodigy, entering the City College of New York at the age of fifteen. He became a regular at Joan Vollmer's apartment and a favorite of Allen Ginsberg when they both spent time at the Columbia Presbyterian Psychiatric Institute. Upon his release, Solomon took a job as editor for his uncle who owned Ace Books, and he brought out Burroughs' first novel, Junkie. He then offered to publish Kerouac's On the Road, but Kerouac thought the advance too little and the two had a falling out. 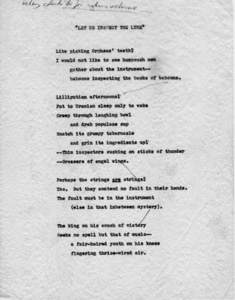 Ginsberg acknowledged Solomon's influence to the developing Beat aesthetic when he dedicated Howl to him. Diane Di Prima. This Kind of Bird Flies Backward. New York: Totem Press, 1958. ONE OF THE few women Beat writers to maintain a lifestyle as flagrantly unconventional as her male contemporaries, Diane Di Prima was often called the archetypal Beat woman. She was already into free jazz, free love, and free experimentation with drugs, when a friend handed her a copy of Howl. She wrote, "I knew this Allen Ginsberg, whoever he was, had broken ground for all of us . . ." She took LeRoi Jones as her lover and business partner, and they started a small magazine called the Floating Bear, publishing the poetry and prose of most of the Beat writers. 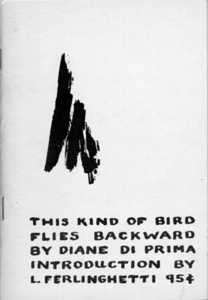 This Kind of Bird Flies Backward was Di Prima's first published book of poetry. 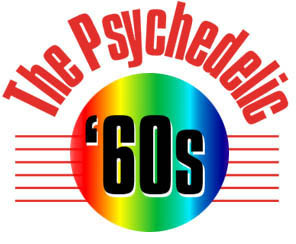 In 1969 she wrote Memoirs of a Beatnik, relating her experiences during the Beat period. 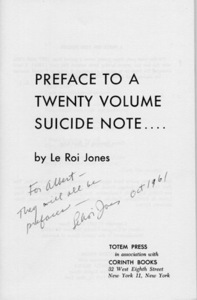 LeRoi Jones. Preface to a Twenty Volume Suicide Note. LEROI JONES, TODAY known as Amiri Baraka, played a pivotal role in nurturing the fledgling Beat community, first as a prolific and respected writer of verse and plays, then as the cofounder of two of the most important journals of the period. With his wife, Hettie Jones, he founded Yugen, after soliciting material from Allen Ginsberg (Jones was also inspired by Howl), and their apartment became a regular hangout for the Beat crowd. 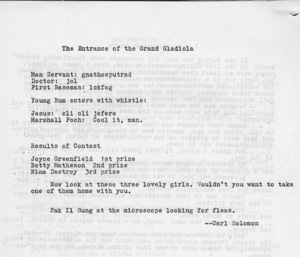 Ginsberg supplied poets from San Francisco, New York, and from Black Mountain College in North Carolina. 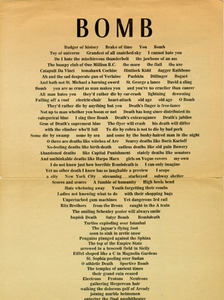 Though Yugen ran only eight issues, it was one of the first serial publications to bring the various poets together. With Diane Di Prima, Jones founded The Floating Bear, a poetry newsletter that published the poetry and prose of most Beat writers on the scene.